Based on an article by the author and first published in the Journal of the Monmouthshire Railway Society, Summer 1985. George Stephenson when building his first locomotive 'Blucher' for the Killingworth Colliery, had adopted the gauge of 4ft.8ins., which was the spacing between the wheels of the wagons then in use at that colliery (the term, gauge' means the distance between the inside edges of the running rails). Stephenson later adopted this gauge when building the Stockton and Darlington Railway and subsequently the Liverpool and Manchester, although an extra half an inch was added at about this time, for reasons uncertain, making the gauge 4ft.8½ins. This gauge was also adopted for two railways, the Grand Junction and the London and Birmingham, which connected with the Liverpool and Manchester Railway. By 1835 the 4ft.8½ins. gauge was spreading over the northern and south-eastern parts of the country and quickly becoming the recognised gauge not for any technical or mechanical superiority but because by now it was generally specified by a clause in the Acts authorising construction of the railways. Strangely this clause had been omitted from the Great Western Act of 1835 and apart from the need to convince the company directors of the desirability of a different gauge, Brunel was left with a free hand. Ironically the defeated 1834 Bill had contained this gauge specification clause and, but for its defeat, the broad gauge would never have come about. The 1834 Bill, carried by the Commons but subsequently rejected by the Lords, was for a line from London similar to that of the present day with the exception of the London end which started at Vauxhall Bridge, through Pimlico, Hampstead and Hammersmith and so to South Acton (later Old Oak Common). Why did Brunel in the face of the more general adoption of the 4ft.8½ins. gauge (which from now on will be referred to as narrow gauge), choose to adopt a wider one? Brunel, even at this early stage in the development of railways, was a visionary who foresaw high speeds and the transportation of large masses. In his own words to the Gauge Commissioners: "Looking to the speeds which I contemplated would be adopted on railways and the masses to be moved it seemed to me that the whole machine was too small for the work to be done, and that it required that the parts should be on a scale more commensurate with the mass and the velocity to be obtained." One of his main aims was the reduction of the rolling resistance of carriage and wagon stock. The wider gauge would allow the wheel diameter to be increased, reducing the effect of friction and allowing reasonably wide carriages to be built with bodies mounted as low as possible, thus keeping air resistance to a minimum. In Brunel's words: "The resistance from friction is diminished as the proportion of the diameter of the wheel to that of the axle tree is increased." For these reasons he advocated the adoption of a gauge of between 6ft.l0ins. and 7ft. Brunel was realist enough to see that there were a number of objections to the adoption of such a gauge. In fact, he mentioned four. The first was the necessary increase in the size of tunnels, cuttings and embankments and the associated increase in their costs of construction. Brunel's own counter to this was that the increase in the size of the workings would not be more than one-twelfth of the original. 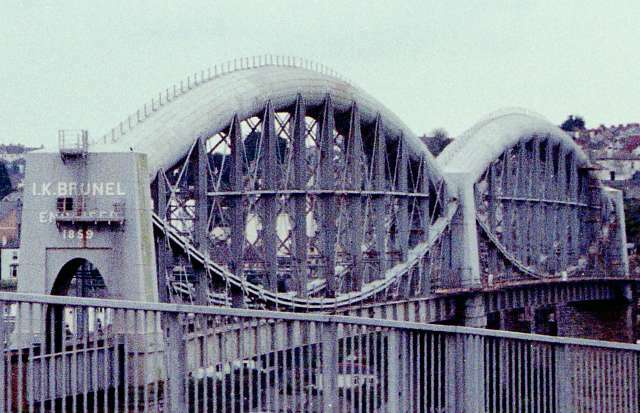 The second objection was the increase of friction on curves but he pointed out that with only l½ miles of curves in a total length of line of 120 miles (depots excepted) the advantages to be gained were by far the greater. The third objection was the increased weight of construction of rolling stock. Brunel did not consider this as an insuperable problem as simplified construction would make the stock lighter per volume than any existing elsewhere. The fourth objection, and the one which Brunel considered as the most important, was the difficulty of effecting the proposed junction with the narrow-gauged London and Birmingham Railway. This last objection was certainly prophetic in the light of the reasons for the future demise of broad gauge. The grounds for this last obstacle were removed when relations between the Great Western and the London and Birmingham turned sour, and the Great Western succeeded in promoting the line from Acton to "a certain space of ground adjoining the Basin of Paddington Canal in the Parish of Paddington", as part of an Act of 1837. A temporary station was erected there, the entrance for passengers being through the arches of Bishop's Road viaduct, but this station had to last until 1854 when a new one was built on the site of the original goods shed to the east of Bishop's Road. The construction of the Great Western was by now underway in earnest, with the western (Bristol) terminus being situated,"at or near a certain field called Temple Mead within the Parish of Temple otherwise Holy Cross in the City and County of the City of Bristol." It was not only in the gauge of the line that Brunel differed in practice to those being adopted elsewhere but also in the actual method of construction of the track-work. The lines in other parts of the country had been laid on individual closely spaced stone blocks, as the Stephensons were doing, or, latterly on closely spaced cross-timbers (sleepers). With these methods the rail formed a load-bearing beam which, with the relatively weak materials of the day, necessitated a rather heavy cross-section. Brunel considered that laying down a broader gauge on closer spaced cross sleepers would be expensive in timber. He therefore developed his own design to get around this. Firstly he designed a special rail section; which became known as bridge-rail. Brunel had this rail supported along its entire length on longitudinal timbers which were joined at intervals by transverse members (transoms), the up and down roads also being joined together by cross timbers. Using this system only a comparatively light rail section (at first) of 43lbs. per yard was necessary. The method was basically sound except for one error of judgement. This was Brunel's use of piles between 8ft. and 18ft in length driven into the ground and then fixed to the transoms and the ballast then rammed home under the timbers as packing. The problem, which soon became apparent on the opening of the London to Maidenhead section was that the ballast settled, leaving the track supported only by the piles, leading to most uncomfortable switch-back rides! Track-work was not the only difficult area with which Brunel was dealing at this time. All the early locomotives purchased by the Great Western, with one exception, were proving themselves unequal to the tasks set them. They were decidedly unreliable. In fact, during the first 18 months of its existence the GW took delivery of the largest collection, even for those days, of freak locomotives ever to run, or in some cases, attempt to run on rails. Some of the responsibility for this state of affairs must rest with Brunel who, when letting the contracts, laid down certain conditions. He allowed the manufacturers to decide upon general form and construction details but stipulated that the piston speed should not exceed 280ft/min. at 30mph., or the weight exceed l0½ tons in working order. This restriction of piston speed was at a time when on other railways a speed of 500ft/min. at 30mph. was commonplace. The makers in keeping with these provisions adopted unorthodox designs. The keeping of the piston speed within the set limit necessitated the provision of large diameter driving wheels. This in turn incurred a weight penalty on an already restricted top weight limit. This in turn led to the adoption of small boilers which resulted in the engines being often short of steam. The engines supplied by Hawthorns 'Thunderer' and 'Hurricane' were so unorthodox as to put them in an experimental class. Early in November of 1837 the first two engines; 'Premier' from the firm of Mather, Dixon and Co., Liverpool and 'Vulcan' from Charles Tayleur and Co., (Vulcan Foundry) Newton-le-Willows, Warrington, were delivered by canal to West Drayton, having come by sea from Liverpool to London Dock8. Vulcan became the first engine to run on the Great Western Railway on 28 December 1837, using the mile and a half of line completed between Drayton and Langley. After these two, the next engine to be delivered was 'North Star', built by Robert Stephenson and Co., for the New Orleans Railway, U.S.A. She was of orthodox design but constructed for that railway's 5ft. 6ins. gauge. The sale of this engine to the American company having fallen through, 'North Start was altered to suit the 7ft¼ins. gauge and purchased (with a similar engine 'Morning Star') by the GWR. 'North Star' arrived at Maidenhead by barge at the end of November 1837 and there she remained until the rails eventually reached this area in May 1838. Before delivery of the first engine, Brunel had been authorised to secure the services of a "Superintendent of Locomotive Engines". He, and the Great Western for that matter, were fortunate in his choice of a 21–year–old engineer Daniel Gooch. Young Gooch had started his professional career in the Tredegar Ironworks, Monmouthshire, and on the death of his father he obtained work at the Vulcan Foundry (founded by Charles Tayleur and Robert Stephenson). But after trouble with his health he obtained a temporary draughtsman’s post with Messrs Stirling of East Foundry, Dundee. In 1836, Gooch moved onto Robert Stephenson and Co., Newcastle~on~Tyne. However, it was whilst Gooch was working on the Manchester and Leeds Railway that Brunel interviewed him and offered him a post on the Great Western Railway as "Superintendent of Locomotive Engines". Daniel Gooch proved to be a first-class locomotive engineer and it was largely through his efforts that the best of the 'freaks' were kept in working order enough to run trains during the railway's first difficult year. It was he and Brunel who did so much to improve the steaming and reduce the coke consumption of North Star when it became evident that she was not as efficient as might be. North Star had shown that she was incapable of drawing more than l6tons at 40mph. Following modifications by Gooch and Brunel, which included increasing the size of the blast pipe and ensuring that the exhaust steam was discharged up the middle of the chimney, she proved capable of pulling 40tons at 40mph and using less than a third of the quantity of coke at that. It was through trials and successes such as this that Gooch was able to design his famous 'Firefly' class of locomotives, which eventually totalled 62 engines. They, with the eventual total of twelve 'Stars' were to prove the backbone of the early Great Western passenger service. Gooch was a stickler for high standards of workmanship and it was his disappointment with the workmanship emanating from some of the manufacturers, coupled with his desire for standardisation within locomotive classes, that lead him to construct at Swindon one of the first railway-owned locomotive works in the country. The first locomotive to be built entirely at Swindon was the 2–2–2 express passenger engine 'Great Western', completed in April 1846. She was to prove the forerunner of a line of express passenger engines built there for the broad gauge. An 0-6-0 goods engine engine 'Premier' had emerged from Swindon works in February 1846, but because the boiler had been supplied by outside contract she was not classed as entirely "home produced". Returning to 1838, for a moment, the early problems with locomotives and track had produced a situation whereupon independent engineers; namely Nicholas Wood and John Hawkshaw (later Sir John), were called in to report on the deficiencies considered to be apparent, not only in the viability of the broad gauge itself but also in the fitness of the locomotives. The professional discord created during this period had Brunel threatening to resign, and one of the leading company directors G.H.Gibbs to doubt the fitness of Daniel Gooch to he head of the locomotive department. Fortunately the combined effects of the inconclusive nature of the reports from the two independent engineers and the decisive way in which Brunel and Gooch had dealt with the shortcomings of the North Star won the day as far as the broad gauge was concerned, at least for the time being. To rectify the shortcomings of the track, Brunel adopted the expedient of cutting through the piles which supported the track-work, allowing the track assembly to be supported by the ground, then re-packing with ballast as necessary. When this work was done the track behaved as had first been expected. The springing arrangements and wheel rims of rolling stock were improved in design and with the advent of more reliable motive power in the form of Gooch's 'Firefly' class the railway at last took on the form of a viable proposition. The most difficult section of the line to construct was the section from Bristol to just west of Box. This 18 miles of line involved the cutting of no fewer than eleven tunnels, totalling just under 5.2 miles, of which Box Tunnel was the longest at 3212 yards being most difficult and labour intensive. The methods used in constructing tunnels in Brunel's day would now be considered too dangerous but were dictated by the crude tools and equipment available. Brunel's success was partly due to the fact that he led his work forces very much from the front. He was often seen to roll up his sleeves and work alongside the men, particularly when the work became more difficult or dangerous. Short in stature but great in spirit and energy he was popularly known as the 'little giant'. His excellent working relationship with the men was helped to a great extent by his sense of occasion. After a force of four thousand men and three hundred horses had been working day and night from opposite ends of Box Tunnel, Brunel was on the spot when the two bores met. So delighted was he at the accuracy of the operation that he removed a ring from his finger and presented it to the ganger in charge. This story was remembered long after the casualties were forgotten.. Casualties were a part of everyday life in the early railway building age. When Brunel was shown a list of more than a hundred of the Box navvies being admitted to Bath Hospital between September 1839 and June 1841, he commented:,, I think it is a small list considering the very heavy works and the immense amount of powder used." Before the construction of the Bristol to London line had begun a broad gauge line from Bristol to Exeter had been sanctioned by Parliament. On its completion, because the Bristol and Exeter Railway Company found itself short of capital, the line was leased to the Great Western which provided the motive power and rolling stock for its operation. The Bristol and Exeter Railway went independent from May 1849 until its final and complete amalgamation with the Great Western in August 1876. During these years it produced its own locomotives at Bristol under the Superintendency of James Pearson, who had formerly been Atmospheric Superintendent of the South Devon Railway. Whilst producing locomotives at Bristol, Pearson introduced his most incredible type; the 4-2-4T well and back tank express passenger engines with nine foot driving wheels. They had a most impressive appearance the like of which was not seen anywhere else in the country. The South Devon Railway Bill received the Royal Assent in 1844, with the Great Western, Bristol and Exeter and Bristol and Gloucester Railways putting up £400,000 of its authorised £1,100,000 of capital. Despite initial success in operating atmospheric trains between Exeter and Teignmouth and then Newton (later Newton Abbot) the system was abandoned. It became more and more unreliable and expensive to repair, and it was dismantled - much to the expense of Brunel's reputation and his pocket (he always used some of his own capital in financing his ventures) and that of the South Devon Railway Company. Before its final shutdown some of Gooch's engines had been made available and normal locomotive working ensued from 9 September 1848. The steep gradients which remained as a result of these early South Devon Railway policies were to have a profound effect on the locomotive policy of the Great Western for the rest of its independent existence and beyond. Impoverished as it was by this expensive failure it was not long before the South Devon Railway was annexed to the Great Western. When the broad gauge 'Cornwall Railway' was added to the Great Western, with its line from Plymouth over the Tamar, then through Truro to Falmouth and Penzance, the GW had the longest through route in the country. Cornwall was to prove a broad gauge stronghold to the end of that gauge as the farming, clay and mineral interests appreciated the prodigious loads and fast times by which their produce was conveyed to London and other centres. A Brunel masterpiece, The Royal Albert Bridge. Built to carry the Broad Gauge into Cornwall. With the experience of his bridge over the River Wye at Chepstow behind him, Brunel built this superb structure over the River Tamar at Saltash, Cornwall. This was built to take single track line, albeit to the generous proportions dictated by the Broad Gauge, on cost rather than engineering grounds. The Cornwall Railway being a relatively impoverished concern. Picture, © the author, taken (June 2000) on Fujicolor Supera 800 using a Minolta SRT-101 and 75-300mm macro zoom from a moving car. Scanned using a Minolta Dimâge Scan Speed. Broad and narrow gauge rails first met at Gloucester in 1844. This happened when the broad gauge 'Bristol and Gloucester Railway' entered Gloucester to terminate at a temporary station made by adding a platform to the north side of the narrow gauge Birmingham and Gloucester Railway terminus. Goods traffic began through Gloucester in September of that year and at once the break of gauge made itself felt, particularly as most through traffic was for the Birmingham line. All such traffic had to be trans-shipped here and the ensuing chaos, some being deliberately organised by the narrow gauge faction, set such arrangement in a very bad light. At the end of 1845, a trial between a broad gauge engine and two narrow gauge engines was arranged. Under the eyes of the Gauge Commission two narrow gauge engines were chosen for comparison with the broad gauge engine Ixion of Gooch's 'Firefly' class. One of the narrow gauge competitors was a new Stephenson engine, 'Engine A', which was tested between York and Darlington. The other was a North Midland Railway loco 'No.54 Stephenson' which ran off the line and fell over after only completing 22 miles. The grades of the lines and the loads pulled being similar, Ixion proved its mastery despite being an older design than its competitors and used less coke and water in the process. Despite the superior performance of Ixion the Gauge Commission decided in favour of the narrow gauge but admitted the technical superiority and potential of Brunel's ideas. Meanwhile the broad gauge had pushed on to Wolverhampton via Oxford, and was poised for expansion to the Mersey. However,the London and North Western Railway, which was an amalgamation of the London and Birmingham, the Grand Junction and the Manchester and Birmingham Railways, took fright at the prospect of a Great Western incursion into its territory. The London and North Western, by various machinations under the leadership of its manager Captain Mark Huish, forced the Great Western to lay a third rail for narrow gauge on some of their lines. Eventually this caused the Oxford, Worcester and Wolverhampton (the 'Old Worse and Worse') and the Shrewsbury railways to throw in their lot with the Great Western, a situation which had not been Huish's intention. These railways being narrow gauge lines, the GWR became almost overnight a broad gauge system with a sizeable mileage of narrow and mixed gauge rails. It was now not long before the narrow gauge tail began to 'wag' the broad gauge dog. From now on, as more narrow gauge lines became amalgamated, particularly the many in South Wales, the Great Western was forced to make much more of its broad gauge mixed. This was done to alleviate the problems of 'break of gauge' which were making themselves felt in numerous places, twenty being recorded in South Wales alone during the period. The third rail for mixed gauge operation reached the very heart of the broad system, Paddington, in August 1861. The writing was now well and truly on the wall, and Gooch looked towards the conversion of large areas to narrow gauge when he became chairman in 1865. The financial hiatus of the company, caused through general expansion both territorial and gauge wars and the general countrywide decline in finance now beginning to improve. By now South Wales was a particularly troublesome area with now over thirty 'breaks of gauge' hampering the interchange of traffic particularly coal. The first gauge conversions took place in 1866 and by 1869, broad gauge trains had ceased to run north of Oxford. Wales saw its last working in 1872 and by 1873 some 200 miles of branches south of the main line in Berkshire, Wiltshire, Hampshire and Somerset had been converted. With Gooch's death in 1889, the conversion of the last miles of broad gauge from London via Bristol, Exeter and Plymouth to Penzance, 177 route miles in all, shifted from being a pressing consideration to that of a plan of action. The need for conversion was indeed pressing, for with the increasing importance of the company's narrow gauge section and the consequent lack of investment in replacement of broad gauge stock, and locomotives ( with the exception of the renewals of the 'Iron Duke' express passenger class and a number of engines and carriages built as convertibles) not much had been produced for more than a decade. Most of the existing stock had therefore by 1892 seen better days. With the experience gained from the conversions to date, the final conversion of gauge was planned with meticulous detail. The general manager at Paddington issued a fifty-page manual of instructions, followed by another thirty pages for the superintendents of the Bristol and Exeter divisions. Preparations at the track-site were equally as thorough. Ballast was cleared, facing points and complex crossovers made up on site in advance, nuts and tiebolts oiled and freed, new rails and every third sleeper or transom on existing track measured and cut and standard gauge locomotives dispersed to strategic locations on broad-gauge trucks. At daybreak on Saturday 21 May 1892 over 4,200 platelayers and gangers were assembled along the line ready for the task. All broad gauge rolling stock and non-essential engines had been worked to Swindon, whereby at mid-day on Saturday 15 miles of specially prepared temporary sidings were filled with such a collection of rolling stock and locomotives as will never be seen again. The conversion was planned to be completed by 4.4 am. on Monday 23 May and it was! This is shown by the fact that the Night Mail from Paddington to Plymouth on the Sunday had been booked, in the instruction issued on 30 April, to proceed from Plymouth North Road to Penzance at that time, which it duly did. Thus in less than two days 177 route miles of main line were converted from broad to narrow gauge with the minimum of interruption to traffic. A truly magnificent feat of engineering and organisation. Temporary sidings were laid especially to receive all the non convertible broad gauge engines they being steamed back as the lines were irrevocable converted to narrow (standard) gauge behind them. The 0-4-4 side tank engine second right, the bunker of which is end on, No. 3542, is one of William Dean's re-built 0-4-2 saddle tanks designed for working in South Devon with a similar engine No. 3548 immediately in front. As 0-4-2 tank engines they proved somewhat unsteady, hence the re-build. Many engines of this class, including these two, were again re-built to narrow (standard) gauge, with side numbers 1118 and 1124 respectively, and by being unsteady in this condition were re-built again as 4-4-0 tender engines. 3542 was built in September 1888, rebuilt as 0-4-4T in January 1891 and converted to narrow (standard) gauge in November 1892. 3548 was built in November 1888, rebuilt as 0-4-4T in January 1891 and converted to a 4-4-0 tender engine in November 1892. Picture is from that reproduced in Russell, J.H. (1975) 'A pictorial record of GREAT WESTERN ENGINES (Volume One)', Oxford Publishing Co. SBN 902888 30 7, page 23. Other information, as was the source for the background image, provided with the aid of 'The Locomotives of the Great Western Railway, Part Two, Broad Gauge', Published by The Railway Correspondence and Travel Society.